The mod includes only skins for the Mercedes Benz Travego 2016 mod which was converted by Commodore and modeled by Can SKMN. – There are 5 Brazilian companies’ skins in the pack. – I don’t any logos used in the skins, however, i edited them. – As it is not easy to make skins for the companies in Brazil, Mexico etc., I’ve tried to do my best to make it similar the real skins. So that, there might be some little differences from the real bus skins. 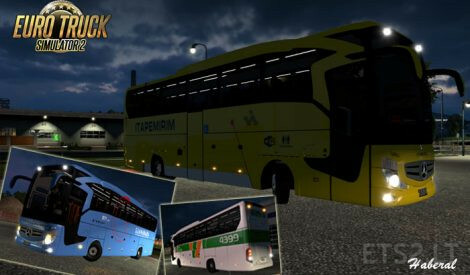 – If you wish, you can delete the skins (DDS files) you don’t wanna have in the pack via “Travego 2016 Skin.zipvehicletruckupgradepaintjob”. It will be showing a pink colour if you delete. “…/My Documents/Euro Truck Simulator 2/mod” and replace it with the old one if it asks. “Cam Skin” for the skin you selected among “Cam (Window) Skin”options which you can find among exterior parts. Meus Parabéns pelo GRANDE TRABALHO E ESFORÇO….Ficou muito Top e show….